Mid-September is here, and fall is right around the corner. It’s that crucial time of year to have chimneys inspected before the home heating season begins. We talk all the time on the blog about the importance of hiring a CSIA Certified Chimney Sweep to perform your annual inspection, because they are the best-trained and most ethical professionals in our industry. But, one thing that we might not have shared enough is how to identify and contact your local certified professional. 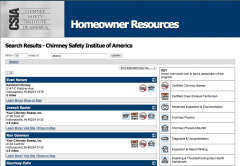 Thankfully, we at the Chimney Safety Institute of America make it easy with the advanced search in the Homeowners Resources section of our homepage at csia.org. When you visit the page, you’re just 5 keystrokes away from identifying your local certified sweeps by zip code. Once you enter your five numbers and click search, a list of professionals will populate your screen. To the right of each sweeps entry, you’ll see icons that give you more detail about a sweep’s professional experience and additional credentials. For example, a graduation cap icon indicates the sweep has successfully trained at our National Chimney Training School. A house icon shows a sweep has completed one of our two-day CSIA Chimney Physics courses. This season, homeowners have a powerful tool to avoid scam artists when they use the CSIA Certified Professional search.